Being the only truly dedicated & retail independent windsurf school that offers windsurfing lessons & equipment hire in Poole Harbour, the No 1 windsurfing location in the UK means we are committed to supplying only the best quality windsurfing equipment for all our students. 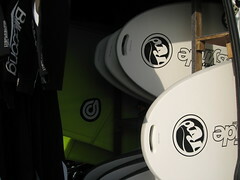 For the current summer season we have all brand new equipment, from boards & sails through to wetsuits & buoyancy aids. With complete freedom to choose who supplies our windsurfing school, we use windsurfing brands & windsurfing equipment that is right for you – the windsurfing student! 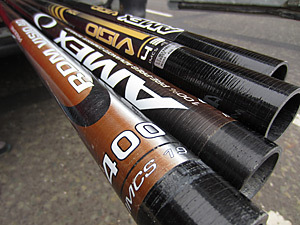 Poole Windsurfing is the only windsurf school in the area to use Reduced Diameter Masts (RDM’s) exclusively throughout their school, making the equipment lighter & easier to handle. A dedicated windsurfing school with all new equipment makes for a great learning environment! 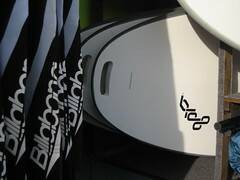 A really well proportioned & well thought out beginner/improver windsurfing board from Goya Windsurfing. Great volume distribution, full soft deck, carry handles, retractable dagger board & very sleek! 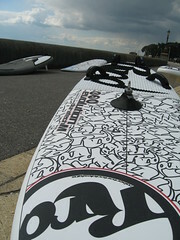 Fantastic beginner/improver windsurf board by RRD. 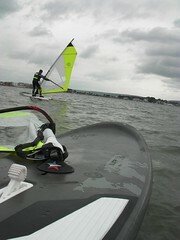 1st time on the water at the Poole Windsurfing school. Overall we have a range of RRD & Goya Windsurfing boards to cover beginner/intermediate windsurfing skill levels, from 220lt, 192lt & down to 180lt boards. This makes your learning fun & progression fast! The RRD Evolution 148lt & RRD Evolution 158lt windsurf boards are great all-rounders that now join our advanced fleet for windsurf hire and windsurfing lessons. Both great boards to progress your skills onto planing, using the footstraps & learning to carve gybe. RRD windsurf boards always come out top in magazine reviews for usability & performance, which is great for those looking to progress fast with their windsurfing. 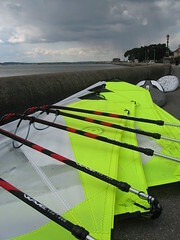 Beginners windsurfing sails from Goya Windsurfing were a really good choice for our windsurfing fleet here at Poole Windsurfing. They are super light weight & have lots of nice little extra features (such as extra padding around the foot of the sail – to protect your feet). The Poole Windsurfing Beginners fleet include Goya ‘Surf’ sails in sizes from 2.5m, 3.0m, 3.5m & 4.0m so we can make the perfect size sail to each student. Intermediate windsurfing to advanced windsurfing sail from Goya freshly unwrapped, rigged & ready to be taken out on the water at Poole Windsurfing. We have a fleet of intermediate windsurfing to advanced windsurfing level sails, including Goya Guru’s in 4.5m & FXR’s in 4.9m, 5.9m, 6.0m & 6.5m sizes. There is always a sail for any given conditions. 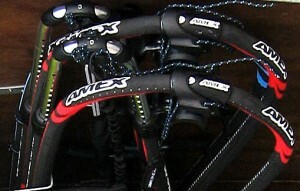 Plus they all rig exclusively on Carbon Reduced Diameter Masts (RMD’s) for easy of use & light weight. An exclusive to Poole Windsurfing, the only school in the area to use RDM’s throughout their windsurfing school, including Amex Visio Carbon RDM’s for the advanced windsurfing sails. RDM’s make a massive difference to the feel of a windsurf sail – easier to handle, lighter in the hands & generally give a nicer allround feel to a sail on the water. RDM’s cost more than a normal mast which is why most windsurfing schools don’t have them in their fleet but at Poole Windsurfing we want to provide our windsurfing students with the best possible equipment & this means using RDM masts throughout the school, from beginners right up to the advanced setups – its all rigged on RDM’s! Amex are a dependable brand when it comes to windsurf booms. The Coreline model features an articulated front end, which give greater flexibility & fit when adjusting to people’s heights. A simple push pin extension system easily adjusts to fit our fleet of windsurf sails & soft grip with narrow diameter arms on the booms make for comfortable use. Billabong is a market leader in wetsuits, the Billabong Mens Foil & Ladies Synergy wetsuits are top class for fit, comfort & features. Super flex rubber, Anatomic paddle Zones and Supra Tex reinforced knees give these wetsuits excellent performance & using them at Poole Windsurfing we are setting a new standard for other windsurfing schools to follow! 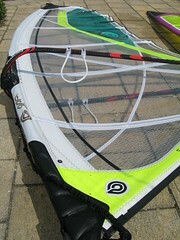 All advanced windsurfing equipment hire includes the use of our Pat Love harnesses. Thermoformed Waist harnesses for a super soft and anatomic fit. These harnesses give great lumbar support and extreme comfort. They include an elastic Power Belt & a Drive-Lock hook-in system with a Neoprene covered front spreader bar. 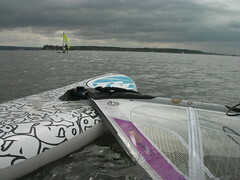 Only the best harnesses are used at the Poole Windsurfing school. To complete the Poole Windsurfing school setup we use Helly Hansen buoyancy aids to keep everyone safe & secure out on the water. 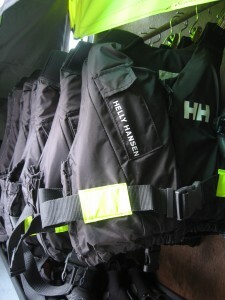 Helly Hansen have years of experience in the watersports safety industry & these ‘Rider’ buoyancy aids are no exception. Designed especially for watersports users, they provide the necessary flotation without hindering your movement – perfect for windsurfing! 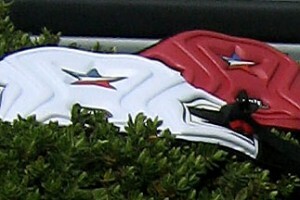 Windsurfing Boards & Windsurfing Sails – What Size? © 2019 Poole Windsurfing. All rights reserved.